I finished my 2017 season in the open waters exactly 3 months ago on Nov 13, after completing the annual 22km-long night marathon swim in Acapulco, Mexico. 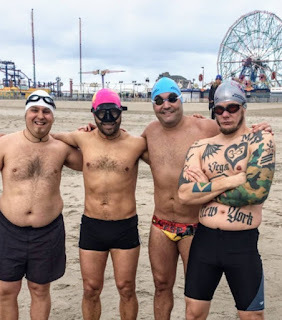 I was talking to Steven Munatones of WOWSA about the year I’d had and about my future events, and he teased me to do a major swim in each continent during 2018 – and so the Continents Seven term was coined and my once-in-a-lifetime project was born. Next thing I knew I was reaching out to Ram Barkai of IISA to include me in the list of 16 swimmers heading to Antarctica in November 2018 to participate in the first ever ICE KM swimming competition down there. Only 10 swimmers have swum in the waters of Antarctica in history and the 15 swimmers coming with me are all experienced ice swimmers. I was all up to the challenge but had a lot of work to do. I had never swum in waters below 60F / 15C and my only experience in ice swimming was reading Lynne Cox’s Swimming to Antarctica during a Trans-Siberian Railway trip I did in 2009 (yes, it was a long ride). So I started reading a lot of books and pages in internet – given that an important part of the sport is self-awareness and recognition of the body signs. Luckily, I live in New York City and this winter has been especially harsh so I could expedite my cold water acclimatization by running outside, taking cold showers and of course – swimming in the beach with the experienced Coney Island Polar Bears. Last weekend I competed in (and won) the 100 and 200 freestyle at the USWSA National Championships. As silly as this may sound, managing to stay in waters of 35F / 1C for almost 3 minutes was a huge achievement for me and has encouraged me towards the qualifying 1km-long swim I need to do to seal my spot to Antarctica. There is of course a big difference from 3 to 15 minutes, but I am confident I will get it done sometime at the end of March or beginning of April in Boston with official observers. Ice swimming does not necessarily attract the fastest swimmers but the most resilient, and if you manage to stay in the water (healthy and conscious hopefully!) and are a relatively fast swimmer, chances are that you will be close to World Record standards. I am hoping that by swimming in under 14’26’’, I will break the overall USA and Spanish records and will be among the Top 3 fastest times in history in my age group. I’d still be far from Petar Stoychev, who held the English Channel record for many years and currently holds the absolute WR for the ICE KM with 12’15’’ – but will be more confident standing next to him next November in Antarctica. PS: You can see some videos of the 25 Free here and of the 200 Free here.